Shango priests store the deity's thunderbolts (Neolithic celts or axe heads), kola nuts, food offerings, oshe Shango (dance wands used to honor the deity), and other ritual paraphernalia in a calabash bowl that is placed on an upturned mortar. 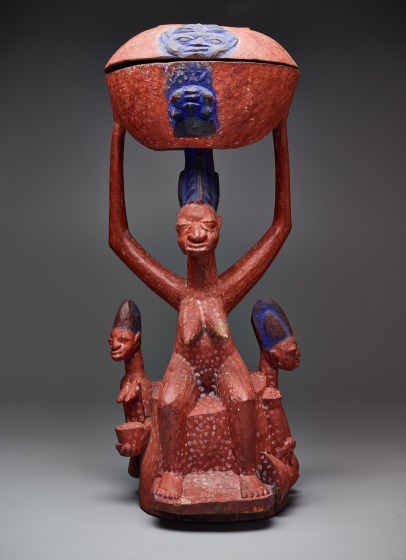 In the Igbomina and Ekiti areas, Shango shrines are adorned with large sculpted arugba, or bowl carriers, as exemplified by the this arugba Shango, carved by Akobi Ogun Fakeye (c.1870-1946), that depicts a seated female holding a lidded bowl above her head. The central figure in a caryatid vessel is always female, depicted either kneeling or seated on a mortar, holding a large lidded bowl above her head with both hands. She represents a devotee who has petitioned Shango for the blessing of a child. That her prayer was answered is indicated by the figure's swollen abdomen and/or by one of the smaller figure carved at either side. The smaller figures on this sculpture are holding ritual objects. The one on her left carries an oshe Shango in one hand and a stockfish in the other, while the figure on her right clasps a bowl. The faces carved in relief on the lid and bowl held by the central figure refer to a ritual practice in which a devotee touches his or her forehead with a kola nut and then repeats this action on the sculpted faces. The face carved on the lid looks toward the viewer; the face on the bowl is placed upside down to look toward the sky world. The faces are darkened with blue paint, traditionally natural indigo pigment, in reference to the ori inu, or the seat of one's destiny in one's "inner head." The bowl itself is thought to be a metaphor for the womb, which Shango can fill with a new life if the devotee is faithful to him. Roslyn A. Walker, The Arts of Africa at the Dallas Museum of Art (New Haven and London: Yale University Press, 2009), 112-113.